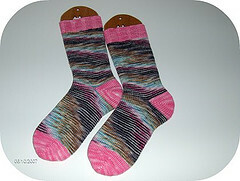 She Finished Her WoolGirl Socks and All is Fine...Super Fine! I showed you the WhatnotSock yarn by Union Center Knits on my Yarn Pr*n Friday picture. I purchased the yarn from Woolgirl , which is one of my new favorite places to shop. Ladies and Gents. I give you the first look at my beautiful socks that are knitted in the colourway of Woolgirl and the coordinating shade of Pink for toes and heels. I enjoyed knitting with this lush yarn very much. It was very soft, pettable and absolutely no splitting. It was my kind of yarn. I used Wendy Knit's Generic Toe-Up Sock Pattern. On this sock I used her older pattern, however she has been knitting different styles of toe-Up and heels. 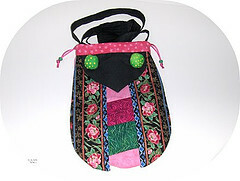 You need to go to her site and check out the different patterns. I'm going to be trying them out. Oh, I need to show you my new purchase from One Planet Yarn & Fiber. It's a Sock Diva Sock Bag. I love this sock bag! It is just the right size for one of my sock projects. Now you know, you can't have enough knitting bags! This is one of my weaknesses. Oh, God Bless America, I swear you can't have enough bags! I used to be that way with shoes.....umm well I better not lie, I still love shoes. I think the knitting addiction has helped the shoe addiction. Is anyone else like me? I just wanted to give those an update that knew that we are in the midst of selling our home and building a new condo. Then the fun things with the new condo as far as working with the agent and what we want to do. Like add 4' to the garage and to the front of the house, bump out the kitchen 2', etc. .....come back and sign more papers. Last week met with the mortgage pre-approval people. Yea....we passed. We went back Saturday to decide where we wanted to place extra electrical plug-ins. Next we meet with security, cable and computer people. Also then we meet with the color people to pick out all the goodies. It's all a process that we must go through and I have to tell myself to take a breath now and then.